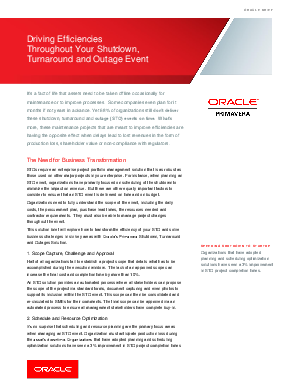 This solution brief explores how companies can transform the efficiency of their STO and solve business challenges in six key areas with Oracle’s Primavera Shutdown, Turnaround and Outage Solution. Understanding STO events are a core part of business. Oracle’s Primavera Shutdown, Turnaround and Outage Solution has been developed to support the transformation of your customers/prospects STO business by providing a predictable solution that supports scope, cost, schedule, risk and change throughout the STO event lifecycle.